For the last few weeks we have been trying out the MyHummy sleeping aid bear. My husband and I have been at a loss at what to do for over a year, we have tried everything. Changing her bedtime routine, changing her bedroom configuration, changing her bed clothes, dummies, mobiles, night lights, teething granules, teething gels, colic mixtures, our bed to her bed transfers, co-sleeping, controlled crying method…anything we could think of or were recommended by friends, we tried. The kid just didn’t want to sleep. For a long time now her general reign of terror has consisted of being wide awake all day (so far so acceptable) but then also refusing to sleep until about 1-2am, usually precluded by hours of trying to soothe and settle, because any attempt at trying to get her ready for bed would send her in to a fit of rage. Then, she would wake a couple of hours later screaming the house down (possibly in rage that she was tricked in to sleep by her devious parents) and the process would begin again. I mean, to be fair to her, she wasn’t particularly grumpy or bad tempered considering she was surviving on about 4 hours sleep per day. For me and my husband however it was a different story. As the months went on she got slightly better, she started going to sleep a bit earlier (still like midnight so don’t be expecting an award or anything Ariel) and would wake maybe once after a few hours during the night, she just gradually got a bit better the bigger she got, but still not great. We were getting a bit more sleep (albeit interrupted) but we were still getting absolutely zero child-free time. It was at this point a lovely company called MyHummy reached out and asked if we’d like to try one of their sleeping aids. There are lots of different designs on offer from MyHummy which is great, some prefer bears they can attach to the cot out of reach, others prefer a doll shape for cuddling, etc. 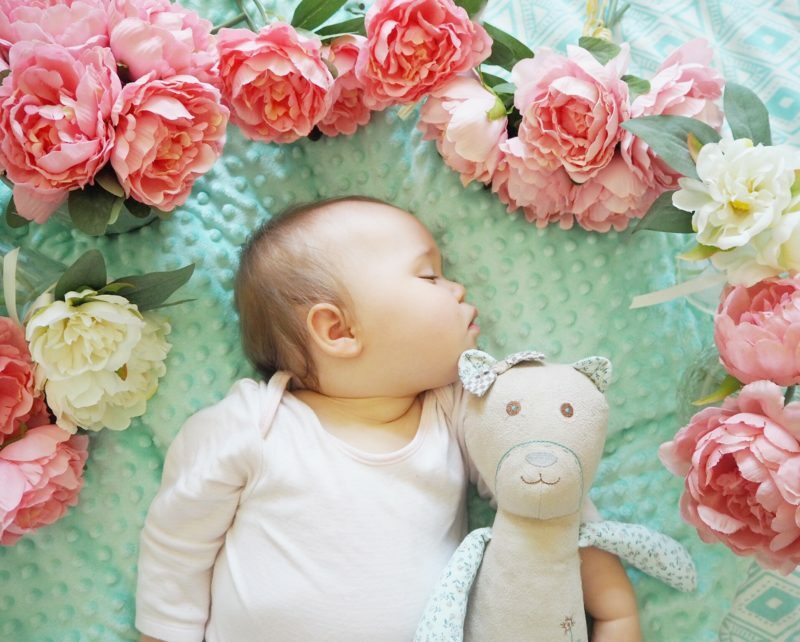 We chose Fleur, a doll shaped bear with pretty floral detailing. Before I even put Fleur’s ‘heart’ in, Ariel took to her immediately. She’s a very cuddly baby, (perhaps why she is so clingy at night time) and by the time it came to bed time she had been playing with her new MyHummy all day. I downloaded the app, and put the batteries in the heart and we were ready to go. Showtime. There was an immediate improvement in Ariel’s bedtime antics. I put on some white noise, I chose the womb noises which imitates what it would have sounded like in my womb with my heartbeat etc, at a low level (all this you can control via your phone on the purpose built app – it’s amazing!) and let her cuddle Fleur as I fed her to sleep. Now I think what made the critical difference was the continuing white noise as the feed finished, and I transferred her to her cot and then crept away. 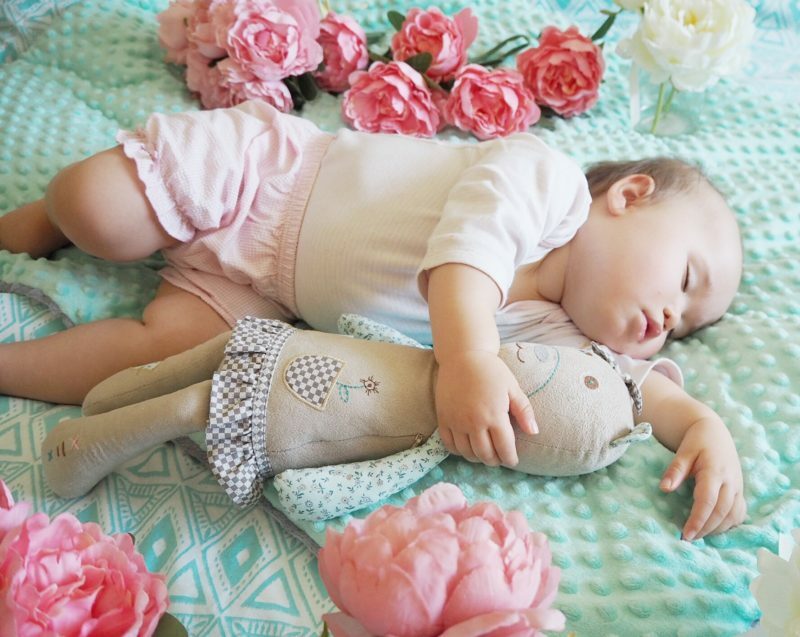 Maybe it was soothing, maybe it distracted her from her mother’s betrayal, maybe it disguised the noise of my treachery…but I managed to get her to sleep, and in the cot, and get myself out of the room…without an immediate meltdown from Ariel. I left Fleur on for a good hour or so, making sure Ariel was in a deep sleep before turning it off. She didn’t wake up again for a good few hours, we repeated what had worked earlier, and (Oh Em Gee) it worked again! 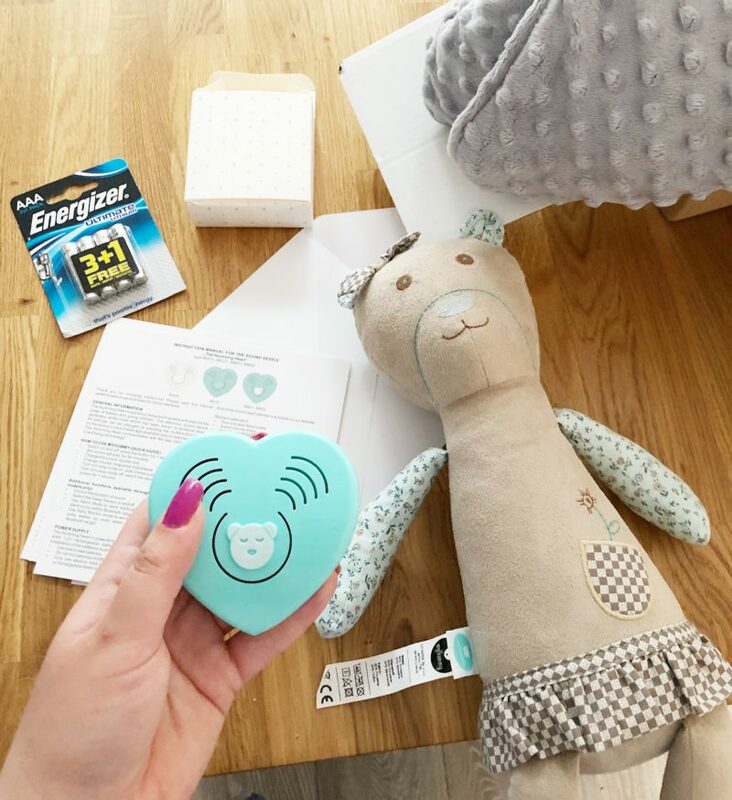 I didn’t want to write a review until we had been using our MyHummy bear for a good few weeks. In that time Ariel’s sleep has improved so much, she is in no way perfect…but she is going to sleep at around 9-10pm now and usually only waking once before morning, sometimes not at all! I couldn’t tell you why exactly it has worked for us, but my guess is the fact that you can remotely control the volume and duration, sleeping aids we have tried before have automatically turned off after a set amount of time, and at that point Ariel would always jolt awake. I love that the MyHummy lets me control when it stops, so I can feel really confident that she’s in a deep sleep and won’t notice first. It seems like such a small detail but it has made all the difference for us. It also has a sleep sensor mode, which will turn itself off after an hour but turn back on if it senses that your baby is stirring…genius! Ariel also just loves Fleur as a toy, she plays with her all the time and cuddles her during the day, so I think the doll shape has been a real winner too. I’m so glad she finds comfort in her bear and it has come to relax her. Maybe she has begun to associate the soothing white noise with bed time too and she is more clear on what is expected of her once Fleur starts humming. We also tried out the MyHummy Luxury Warm blanket and it is so thick and so soft…my husband has asked if I can get more of them and stitch them all together to make a giant one for him. After persuading my enthusiastic husband to give the blanket back, I have since been laying it in the bottom of Ariel’s cot to sleep on. It’s become like a padded, soft mattress topper for her and she loves it. As soon as I put her on top of the blanket she starts wriggling in to it getting comfy. It has definitely helped make her cot a comforting environment. Whatever it is, we are thrilled with our MyHummy bear. There are five different types of white noise to chose from, you can be in complete control of volume and duration and you also have the fantastic sleep sensor on your side too. I only wish we had started using Fleur sooner. 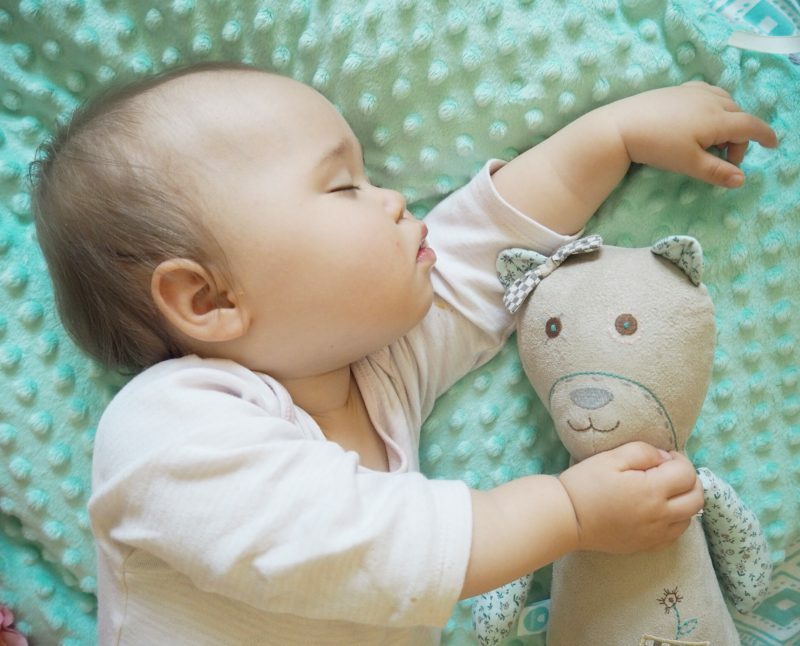 If you’re struggling with a sleepless baby, I would absolutely give the MyHummy a go, although I know it won’t be a miracle cure for some, all babies are different and have issues with sleep for many different reasons. 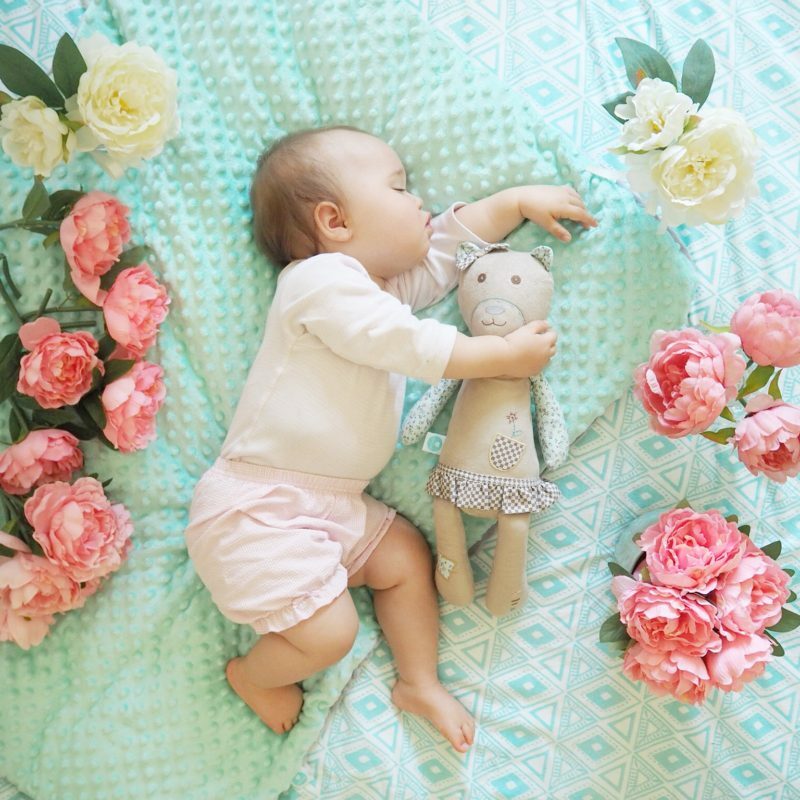 However, we think our baby’s sleeping problems have been largely due to separation anxiety and clinginess, needing comfort and constant soothing in order to reach a deep sleep…and for that, the MyHummy has been invaluable. Fleur is now our full time night nanny! To learn more about MyHummy head to their website by clicking here.